Our builders mega pack has been updated, all documents are now on our 2019 templates and we have added a couple of extra documents. This 54 document pack is on special for £59.99 For this month only. ..
We have completed a new House builders pack, this contains 29 documents including Method statements, risk assessments and COSHH The pack is now available for purchase HERE ..
For February 2019 we have placed our Professionally written Builders method statements, risk assessments and coshh documents pack on special offer For £79.99 our pack contains 50+ documents, all written by a Chartered Building Engineer with more than 30 years site experience. These completed examples need very little editing, mainly site related safety and other data. ..
Our Demolition method statement and risk assessment have now been updated and on our 2018 template. On special for the next week here http://www.method-statement-template.info/demolition-method-statement-and-risk-assessment ..
Are your safety documents up to date? We have just added an example method statement for airless paint spraying, this also contains FREE Risk assessments for work at height and Slips trips and falls and as a bonus 3 coshh assessments for the paint products used in the example. ..
We have just upgraded our register and checkout system into a single page, As all our items are downloads we dont need delivery addresses or your blood type! Simply add items to your cart and when ready just select the checkout button, here as a new customer you can register with just an name and email address, add a password to your own account area, then press "confirm order" and you will be taken to paypal to finalise your purchase.........The whole process will take less than a minute. ..
We have just added 3 new products:- Method statement for general and contract cleaning Method Statement and Risk Assessment for Mechanical Sweepers Method Statement for the Installation of underground Tanks Check the "latest" section of our website. ..
Our prices have been lowered by as much as 75%, This is a short term experiment to see how this change compares with some new competitors sudden organic rankings on Google, we have noticed that the products being offered by some of these are very poor and the website owners are not health and safety professionals and neither do they supply clear contact information such as telephone numbers. For a current listing of our method statements and risk assessments click HERE ..
We have added a combined method statement and risk assessment template, this is now asked for by many clients and our new template is proving to be very popular for all types of work and naturally all types of company. Easy to complete using Microsoft Word ™. ..
Our very popular builders mega pack has been updated with more construction related method statements and risk assessments and includes our 2014 edition blank templates with 27 documents now included. Purchased individualy they would cost over £200 but we are keeping the Package at just £49.99 until the end of January 2014 These have been written by our expert who is a Chartered Building Engineer with over 30 years of experience in the construction industry, he has successfully managed high value projects and has always placed Health and Safety as his main focus, he is fully supported by..
We have added more FREE Risk Assessments to out Free Method Statement and Risk Assessment section, the current products that you can download are:- Risk Assessment for Buried & Overhead Services Risk Assessment for Abrasive Wheels (Cutting and Grinding) Risk Assessment for the use of a Cement Mixer Risk Assessment for the disposal of waste materials COSHH Assessment for Sikadur 32 COSHH Assessment Template Method Statement for Trial Holes Method Statement for Plastering Method Statement for PAT Testing (Portable Appliance Testing) Permit to Work Hand Back c..
Just added some New products......... Method Statement for Block Paving NEW Blank Method Statement & Risk Assessment combined into a single document, with added PPE Symbols COSHH Assessments for Paints ..
Shopping online can be risky at times, we have now installed a great brand new system, we only need your name and email address, a password and thats it! All our products are digital and are downloaded from our customers account area, this is a breeze. We use Paypal as our payment provider and they are ultra secure, this coupled with the mediocre info we need to set up your account will give all potential buyers a much needed sigh of relief as they know that their personal details are secure. .. So much has been written on the subject and there is a large amount of fairly poor information being supplied. For people new to Health and Safety this can be a difficult subject, in fact many people are unduly scared of making mistakes that they will often procrastinate or ignore their health and safety obligations. So what are Risk Assessments and method statements?, and whats the easiest way to compile them? In basic terms:- Study your work site and work area with the work thats to be done in mind, note what hazards you see, these should be work and site related. Note who o..
Our latest product is a risk assessment for site waste management. ..
A great 3 page detailed Risk Assessment for powered woodworking tools, suitable for tempory workshops, shop fitting and construction work the main associated risks covered are:- Cuts Noise Dust Slip and Trips Electric Shock Eye Injuries Each of these main risks has staeps to reduce the risks, and more. ..
We have just added a new product! Risk Assessment for General Electrical Work covering Electric Shock Fire Slips trips and Falls Working at height ..
We have now reconfigured our system and can now offer free downloads, we have free Method Statements, free Risk Assessments, Free COSHH Assessments, as well as our COSHH assessment template and permit to work and handback certificate forms and will be adding items here as often as possible. ..
We have added free coshh assessments to our Air-conditioning Maintenance and Repair Method Statement, Our Installation of Central Heating Method Statement and reduced the price of our Carpet cleaning Pack to £8.99 and this pack also includes free coshh assessments. A new product is our Sikadur 32 Part A and Part B Coshh Assessment. We will be adding more coshh assessments in the next few days, bookmark us. ..
Our new pack for painters, Contains a Method Statement, risk assessment for work at height and risk assessment for slips trips and falls. With 6 coshh assessments:- Water Based Emulsion Paint Leyland Paints- High Gloss Dulux Trade- Diamond Matt Dulux Trade- Weathershield Smooth Masonry Paint Dulux Trade- Satinwood Dulux Trade- Supermatt All these purchased individually would cost just over £80, Our price is set at just £27 Pounds! and with a new item discount the current price is just £17.99 ..
Just added, a 3 page method statement that not only covers taping and jointing but plastering works. This method statement comes with a COSHH Assessment for Gypsum Plaster, This should be used alongside the method statement to brief those who will be carrying out the works. ..
We have had some requests for a Pack that will be suitable for Brick and Block laying Work This is now available and contains :- Method statement for brick and blockwork Risk Assessment for brick and blockwork Risk Assessment For Working With Cement Mixers COSHH Assessment for Ready Mix Cement COSHH Assessment for Silica Sand Blank Method Statement Template (2013 edition) Blank Risk Assessment Template (2013 edition) Pack Price Special is less than 1/2 Price at £22.99 ..
After many hours of editing we are happy to announce that our Combined Method Statement, Risk Assessment and COSHH Guide and Example Pack has been updated to our 2013 edition. With over 70 Pages of guides, examples, hints and tips as well as blank templates. 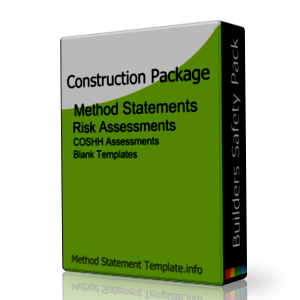 If you are new to Method statements, Risk Assessments and COSHH then this pack is ideal and you will be writing your own with confidence in a couple of hours or less. To help even more! we have decided to give away our 2013 template pack with this product and this will appear in your downloads area when you purchase our new ed..
We recently added even more documents to our "Builders Mega Pack" giving a total of 24, This value based on current individual prices is £215 which is a reasonable price, but we have decided to keep the special offer price of a paltry £49.99!, this means you are getting each document for £2.08 We must be mad but understand that everyones feeling the economic pinch. Obviously we cannot keep this special offer going for much longer and will have to end it before too long. ..
Our best selling method statement and risk assessment guide pack has been updated for 2013 and released today the 18th of June more guidance and examples have been added and this item in bundled with our blank templates 2013 pack ..
We have seen a surge in the number of customers looking for example method statements for a large array of work types, To satisfy eveyone we would need to have hundreds if not thousands of these documents listed. Our Most popular "Method Statement & Risk Assessment Pack contains simple and advanced examples, guides and useful information to enable anyone to read our guide and then write a method statement or risk assessment using our blank templates. ..
As our returning visitors will have noticed we have just upgraded our shopping cart system, this update provides excellent user interfaces and streamlines the processes. ..